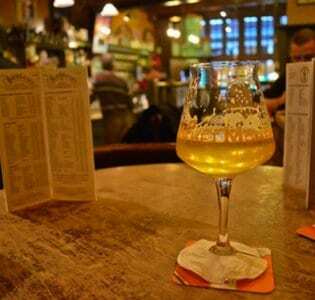 With its distinctive window panes, the amusingly named Wynand Fockin, located down a narrow alleyway just off the Dam square, is one of the oldest bars in Amsterdam. Back in the 1670s, the eponymous Fockink opened a spirits and liqueur distillery on the Pijlsteeg in with a tasting house and a shop attached; three centuries later, the place is still going strong, the original distillery, where they made their own jenever – a juniper-flavoured drink not dissimilar from gin as well as a range of other liqueurs, is now a museum boasting an extraordinary collection of antique bottles. The tasting house itself continues as a drinking establishment where you can sample a range of over 60 different jenevers and liqueurs, each served in distinctive little hourglass-shaped shot glasses, which are filled up to the very brim in the traditional manner, obliging you to bend down to the counter to take your first sip or risk spilling your tipple. The room is as atmospheric as you’d expect from a bar of its age and history, stuffed full of bottles and stories, though surprisingly light thanks to those large windows, and it attracts a nice mix of tourists and locals. 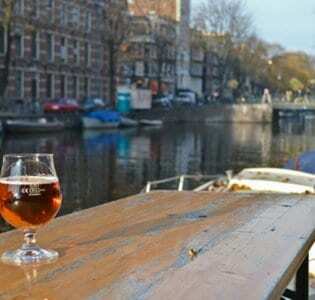 Definitely one to add to your Amsterdam liquid itinerary.